Pinoy Puchero, Pochero with Eggplant Sauce. I have tried to cook this pochero dish as close as possible to the version of Nora Daza from her cook book titled Let’s Cook with Nora Daza. Incidentally this is my first cook book which help me honed my cooking knowledge. 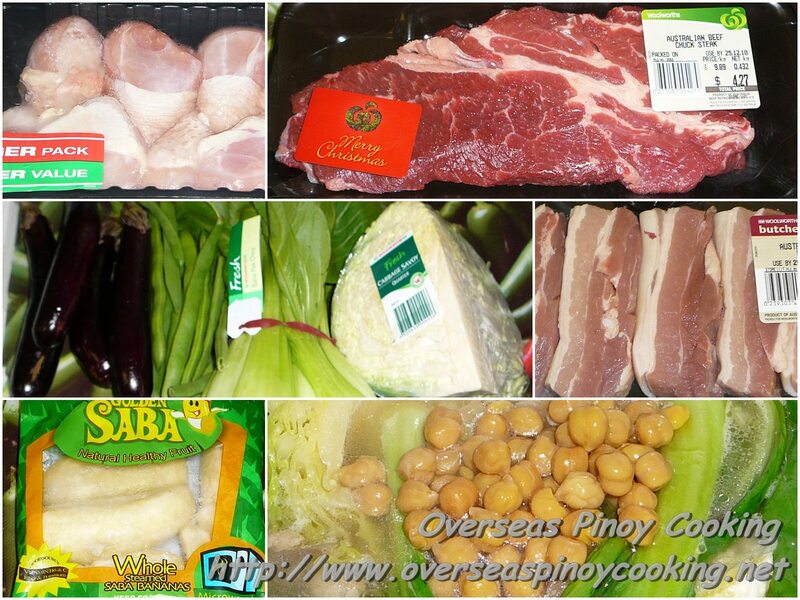 I find the recipe’s cooking method laborious with all the individual boiling of the meat and vegetable ingredients. I have to revised it to an easier to follow cooking method including the eggplant sauce where raw garlic is mixed to the broiled eggplant. On my version I boiled all the meats (chicken, pork and beef) together in a big sauce pan, this way I can scoop out all those scum that normally rises when boiling meats in one step. The meats do not become tender at the same time either therefore once the chicken gets tender it was to be removed from the pan then the next meat either the pork or the beef it defends which one get tender last. I did not also boil the bananas, potatoes and the vegetables individually, I just added them in stages of cooking. If you like to serve the ingredients and the broth in separate platers and bowls, you can always individually pick the ingredients off from the pan. For the eggplant sauce I find the garlic a bit strong without cooking, so I had to stir fry it with the mashed broiled eggplant. There are other versions of pochero out there some uses tomato sauce, there is also a version where pork and beans are added to the sauce. (See my Pork Pochero with Pork and Beans post). The Cebu style pochero uses pork shank or beef shanks with corn in cob (See my Cebu Pochero post). I guess the pochero has evolved to different versions base on localities.Here is the recipe of my version of Pinoy Puchero, Pochero with Eggplant Sauce. In a large sauce pan put in all the meats and about 2 liters of water, bring to a boil and simmer until scum start to appear. Scoop out all scum that rises. Now add in the leeks or spring onions, peppercorns and salt to taste, continue to simmer for 20 to 30 minutes or until the chickens are tender at moderate heat. Remove the chickens from the pan and keep aside. Continue to simmer for another 20 to 30 minutes or until the pork or beef are tender. Remove either one which becomes tender and keep aside. Continue to simmer until the remaining meat becomes tender, remove from pan and keep aside. Transfer the broth in a big bowl using a sieve to filter out the residue and keep aside. Using the same sauce pan heat some oil and sauté garlic and onion until fragrant, add in the chorizo and stir cook for 2 to 3 minutes. Now pour about 1 1/2 liters of the reserved broth, use water if not enough. Add in the potato, bring to a boil and simmer for 3 to 5 minutes. Add in the boiled meats and banana and continue to simmer for 2 to 3 minutes. Correct saltines if required. Add in the vegetables and chick peas, simmer for another 2 to 3 minutes or until the vegetables are just cook. Remove from heat when done. To make the eggplant sauce, using a small frying pan heat some oil and stir cook the garlic until fragrant. Stir in the chopped broiled eggplant and continue to stir cook for about 2 to 3 minutes. Turn off the stove, now add in the vinegar and stir/mix thoroughly . Season with salt and pepper to taste. When done transfer in a small sauce plate and serve with the pochero.